If you’ve not had the pleasure of eating a black truffle, it’s impossible to describe the flavor, because they taste like nothing else. The scent of a truffle is heady, earthy, and exotic and will arrive well before your taste buds get to work. Once you’ve tried truffles, you will never mistake them for any other food. You will never confuse them with portabellas or parsnips. They are simply unique. Truffles are expensive, seasonal, and perishable. Fortunately, there are several seasons in different parts of the world. Unfortunately, you’re unlikely to find them at your corner grocery store, unless it just happens to be a specialty market. While truffles certainly command a high price per ounce, the good news is that you don’t need a lot to make a great impact—a small truffle will go a long way. When they're in season, you can find truffles online and have them shipped to your door. If you’re craving them out of season, you can find truffle pastes, salts, and oils that can deliver the flavor you crave. We've found the best places to buy black truffles and products made with them, making it easier for you to indulge. 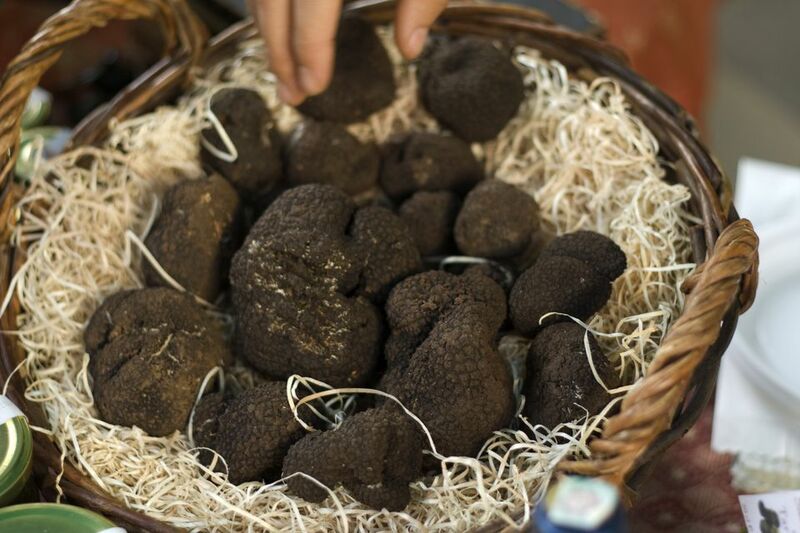 A good starting point for your truffle shopping, Gourmet Foodstore sells black truffles and truffle products. The black truffles are primarily from France and Italy. The truffle flavored products include tempting truffle olive oil, truffle burrata, truffle butter, and more. They also have other delicacies made with different mushrooms that are fun to explore. Beyond the products, Gourmet Foodstore offers a plethora of useful information about types of truffles, grading truffles, cooking with truffles, and much, much more. Marx Foods is a perfect place to do your truffle shopping. Besides fresh black or white truffles in season, you can order frozen truffles as well. The truffles come from all over the world, including France, Italy, Oregon, and Australia. You’ll also find truffle cheeses, oils, butters, and even truffle juice. Since you might want something special to serve those truffles with, Marx also sells meat, seafood, poultry, and pantry ingredients to round out your purchases. Urbani Truffles might seem familiar, possibly because you’ve seen the small cans of truffle mixtures at your local grocery store. The cans—about the size of a can of tomato paste—contain truffles mixed with mushrooms, cream, herbs, or other ingredients. This is nice because it offers the flavor of truffles at an affordable price. If you can’t find them at your grocer, they’re available on Amazon as well as directly through Urbani. The company has been in business for generations, and you’ll find even more truffle products as well as fresh summer truffles on their website. Eataly has been making a name for itself with its high-end grocery stores. If you don’t live near a store, you can order online. The store has an Italian flair, and so do the truffle products. You will find fresh truffles and oils, of course. Yet, the pasta, breadsticks, sauces, and salts made with truffles are just as interesting and worth exploring as well. Sabatino Tartufi is a well-known name in the truffle world. With old family roots in the heart of Italy's truffle-filled forests, they offer some wonderful finds for truffle lovers. There are truffles. There are truffle butters. There are truffle honeys. There are truffle seasonings. It just keeps going, with truffle soy sauce, infused oils, sauces, and preserved truffles. Meanwhile, the Pronto line takes mac and cheese (and other comfort foods) to a whole new level of decadent truffle convenience. Earthly Delights is a great place to find all sorts of specialty foods. Truffles and truffle products just happen to be one of their specialties. You’ll find fresh truffles in season, from Italy, France, and Oregon. They have a few truffle products as well as frozen truffles. Beyond that, you’ll also find a whole host of interesting products including charcuterie, cheese, and spices. This could be a one-stop shop for your next elegant event. Get ready to browse because the truffle and mushroom section at Marky's is a mushroom fan's dream. It has everything from fresh truffles to truffle puree in a tube. Browse further and you'll come across foie gras, seafood, meats, cheeses, pasta, condiments, and teas. You’ll even find cooking and serving items, like an escargot plate, caviar spoons, and a foie gras slicer. At gourmet food supplier, D'Artagnan, you’ll find fresh French and Italian truffles. What's really nice is you can sign up to be notified when the truffles you want become available. They also offer a select line of truffle oils, butters, and preserved truffles. The selection isn’t as large as some sellers since they only carry their own labeled truffle products. However, the quality is said to be top-notch. While you're there, explore the fine meat, game, poultry, charcuterie, and pantry items like duck fat and veal demi-glace they have to offer.